Hi everyone! 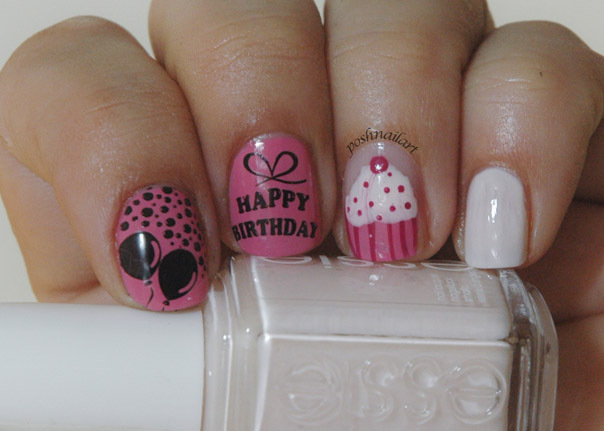 This month I will be showing you birthday nails, because August is my birthday month! Also, I did not want to finish the year without showing you some birthday designs. As a child, I secretly wished having a winter birthday, so I could give a big party with all my freinds but now I realise that having a summer birthday is actually better. Tell me about pool parties, or beach parties! Anyway, this month’s designs are not just for summer, you can use them all year long. So, let’s go! For the first design, I went for the girly pink look. I hand painted the cupcake. It is actually really simple. 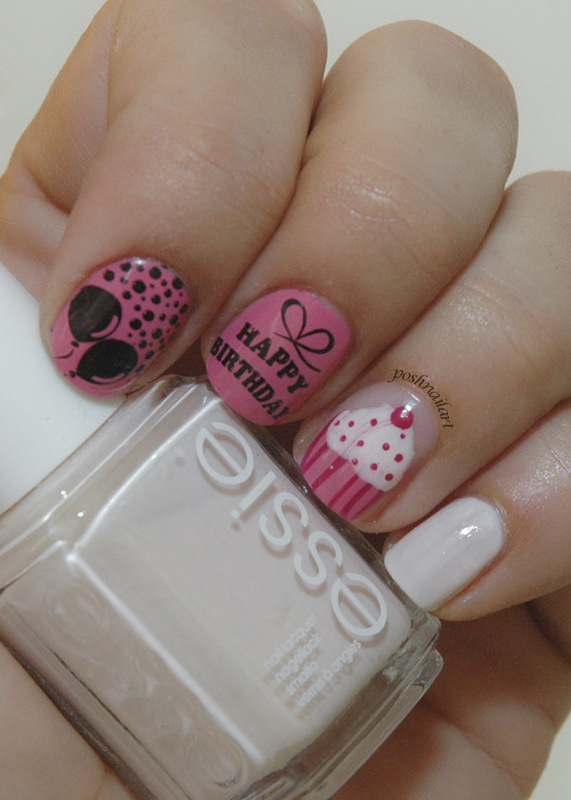 On my bare nails, I painted the bottom part of the cupcake with pink polish. With a darker shade of pink and a thin striping brush, I added thin lines. For the top part of the cupcake, I made some blobs with a pinkish white, in this case, Essie Fiji, and using a dotting tool, I added the pink sprinkles and the “cheery on top”. 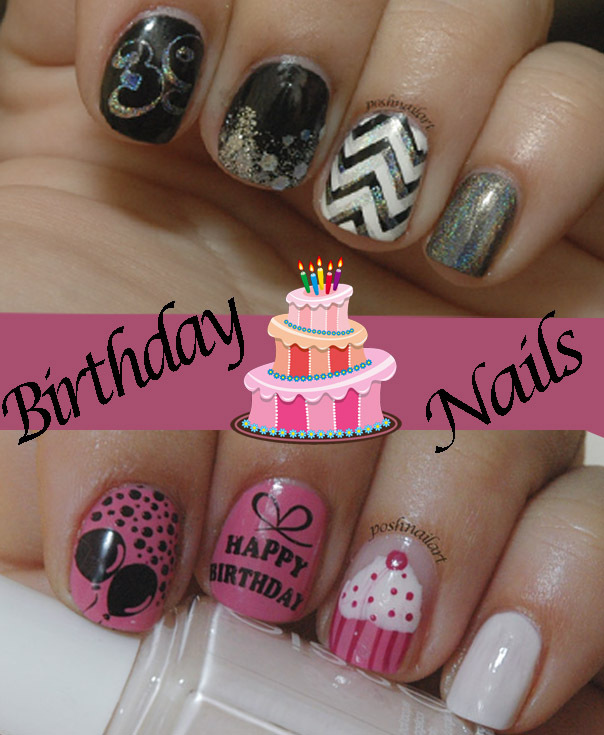 The other nails were made with black stamping polish and birthday themed nail art plates. For the second mani, I went for a little bling. 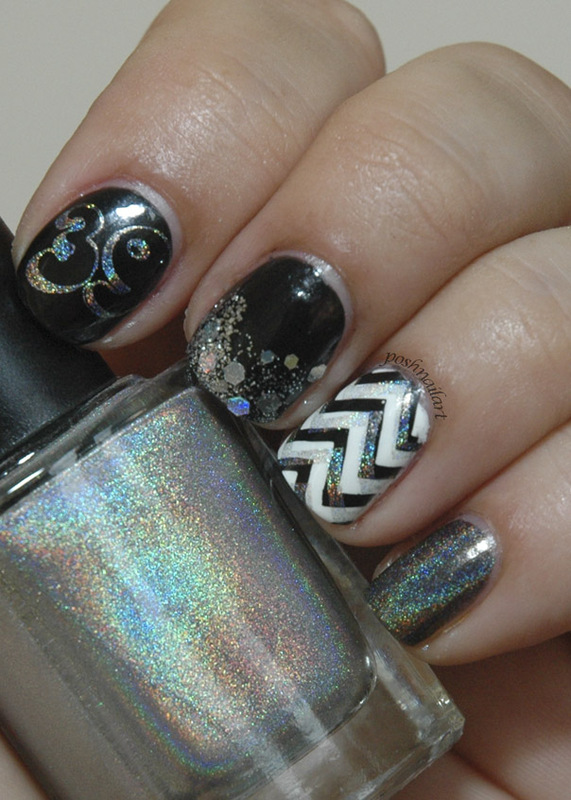 Well, it is no secret that I love holos, chevrons, glitter and black. So when I combined all these, I got this look. Index and middle fingers are painted black. My age, “gasp! Yep, I’m that old” is stamped with holographic silver polish. Some silver glitter is dabbed with a sponge on the middle finger. The ring finger is another story. Painted white, and then double stamped chevrons with black and holo silver… And finally, the pinkie is pure silver holo. I personally prefer the first set of nails for a birthday brunch or coffee with friends while the second one is totally is for a night out! Untill next month, you may visit Posh Nail Art blog for more ideas.